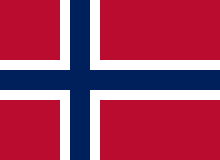 Norway was represented at the 1972 Summer Olympics in Munich by the Norwegian Olympic Committee and Confederation of Sports. 112 competitors, 101 men and 11 women, took part in 70 events in 15 sports. Norway finished in 21st position in the final medal rankings, with two gold medals and four medals overall. In the first modern archery competition at the Olympics, Norway entered one woman and three men in the competition. Their best finisher, at 32nd place in the men's competition, was Jan Erik Humlekjær. Seven cyclists represented Norway in 1972. Five fencers, all men, represented Norway in 1972. Jan von Koss, Jeppe Normann, Ole Mørch, Claus Mørch Jr.
Norway's 1-1-1 record in the first round put the team in a tie for second place with West Germany (which was the team that Norway had tied), but the advantage went to the West Germans and Norway's third-place finish put them into the ninth- to twelfth-place consolation bracket. They defeated Japan to set up a match with Poland for ninth and tenth places, which Norway won. Seven male shooters represented Norway in 1972. ^ "Norway at the 1972 Munich Summer Games". sports-reference.com. Retrieved 2011-02-19.